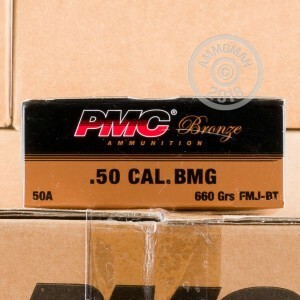 PMC brings you a selection of 50 BMG rounds to feed your big gun, without breaking the bank! 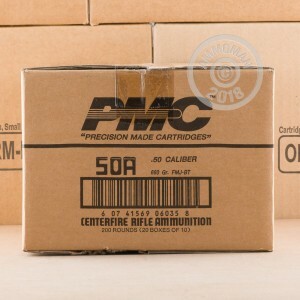 These PMC Bronze rounds are new production, brass cased, boxer primed and reloadable. They feature a massive 660 Grain Full Metal Jacket-Boat Tail bullet, for long range accuracy and weight retention. 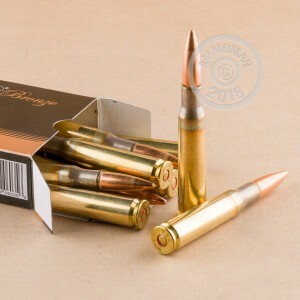 Going back to 2009, I bought many boxes of this to establish a brass supply so I could begin reloading my Barrett M82. I will say that these do have quite a punch, however I soon discovered that the FPS was a tad too fast per Barrett directives and also from personal attendance at their classes. The 82 functions best at 2600-2700 FPS as I discovered after reloading my own. On a hunch, I took 50 random rounds from one of my ammo cans (same lot #), broke them open and weighed each powder charge. In this random selection, I found a 12 grain spread and that answers why I felt more recoil in some shots as compared to others. I reloaded the powder back at a consistent metering and was able to achieve the FPS close to the Barrett specs as recorded with a chrony. I did have extra powder left over and since it was unidentifiable, it ended up scattered in my back yard. I have since used up all the rounds and I am reloading them now. I also discovered that the case neck thickness is .001" thinner than lake City, WCC and the others. If neck tension is on the top of your list, be aware of these. If you just want to blast away and clear shooting benches on either side of you, this will work really well. COL, or I prefer Length Over All, was pretty good but please bear in mind that the ammo is mass produced so you will not have the loaded accuracy as doing it yourself.